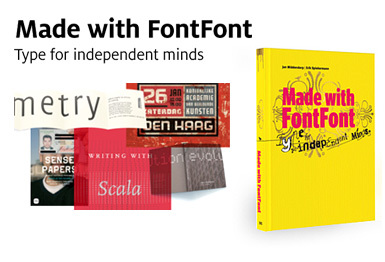 Made With Fontfont: Type For Independent Minds, edited by FontShop co-founder Erik Spiekermann and Dutch writer-designer Jan Middendorp, showcases the history and influence of the award-winning foundry. The book is replete with real-world examples of FontFonts in use, from high-profile ad campaigns for big automakers and fast food giants to iconic poster designs for the Tyson/Tubbs heavyweight battle in Tokyo and New York’s Shakespeare in the Park. Total 352 pages, color illustrations. Thinking FontFont: An anthology of essays and type critiques – With articles by John E.Berry, Akira Kobayashi, Emily King, Martin Majoor, Erik Spiekermann, LettError, Antje Dohmann, Fred Smeijers, Jan Middendorp and others. Talking FontFont: Interviews on type design with Chris Burke, Hans Reichel, Siegfried Rückel, Ian Lynam and Mike Abbink. Showing FontFont: A new view of the type specimen, that ancient marketing instrument and intellectual challenge. Designers from many parts of the yorld contributed specially designed (and written) type specimens to the book. Includes work by Ellen Lupton, Mark Thomson, Studio Dumbar, Reza Abedini, Jaap van Triest, Yang Liu, Laura Meseguer and others. Made with FontFont: Designers’ pages, posters, postcards, magazine covers, t-shirts and other products made with FontFonts. Includes designs by the likes of Paula Scher/Pentagram, Neville Brody, Rian Hughes, eBoy, Cosmic and many others. This entry was posted in Creative Tools and tagged alt.TYPE. alttype, Book, Erik Spiekermann, Jan Middendorp, Made with FontFont, singapore, typeface design, typography on October 5, 2012 by alt.TYPE.